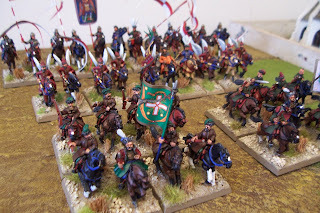 Just to ensure people that I am still working on finishing the Muscovites here is a photo of some of the cavalry. Fantastic ... really colourful armies, huge flags... what's not to like! Looking Fantastic Scott, my next unit of Ansar should be finished by the end of week. only have the command to do and that is it.